Kayaking on the tidal Thames is an exciting and challenging way to explore London’s maritime heart, but you need to keep your wits about you, as Steve Rushbrook from Port of London Authority and Harry Whelan from Kayaking London explained at a recent symposium for London paddlers. We started the day with a presentation from Steve, before taking to the water with Harry and other staff from Kayaking London. Port of London Authority are the guys who manage navigational safety on the tidal Thames, from Teddington right down to the Thames Estuary. The PLA is based in a control room which overlooks the Thames Barrier at Woolwich, from where their staff monitor and oversee the movement of shipping along this, the busiest inland waterway in the UK. The tidal Thames stretches as far as Teddington Lock, marked on the far left (west) of this map which shows the Thames as it flows through London. The PLA are supportive of recreational use of the tidal Thames by kayakers, providing we don’t put ourselves or other river users at unnecessary risk. For safety reasons, other craft are not so welcome. SUPs or Stand Up Paddleboards cannot be used on the river below Putney Pier. See Stand Up Paddleboarding on the Tidal Thames (pdf). The PLA advisor was not overly keen on open canoes using the tidal Thames either, but experienced paddlers who can handle strong currents and rough water may enjoy the trip. The Thames has a tidal range of 7.5m with a typical maximum flow of four knots an hour. This flow can rise to five or six knots with rainfall. Swells of 1.2m are typical, with choppy, confused water, confined by sheer river walls and exacerbated by large boats. As it is a tidal river the Thames rises and falls with the tides. Tide charts are available online from the PLA. You don’t want to get this bit wrong, you won’t get far paddling against a four knot tidal flow. Good get on points are few and far between. The sheer river walls are regularly breached by old river steps, but these can be rotten, slippery and treacherous with a running tide. Many of these steps are guarded by locked gates, but if needbe they could be used as an emergency exit. Click here for some suggested get on points. 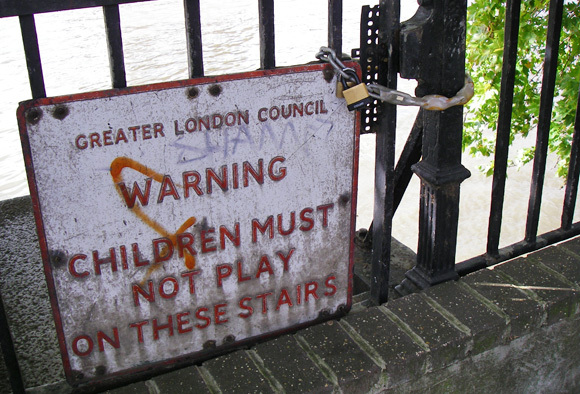 Access to the tidal Thames in central London isn’t easy. Out on the river it is easy to be distracted by the sights, but as a kayaker you need to keep constantly alert for other river traffic. Everything else on this section of the Thames will be considerably bigger than you and generally going much faster – and you can’t assume they will see you or be able to take evasive action. Traffic can come from all directions – so keep checking over your shoulder. Navigation rules for kayaks are the same as for other boats – keep starboard – you should keep as far to the right of the river as you can. So, if you are heading upstream and inland, you will be paddling closest to the north bank. Coming downstream, towards the sea, you will be paddling closest to the south bank. The size of most traffic restricts it to the deeper channels in the middle of the river, but pontoons and piers can be very busy with boats zipping in to drop off and collect passengers. Kayakers need to be especially careful as they pass such busy pontoons. A vessel of less than 20m in length or a sailing vessel shall not impede the passage of a vessel which can safely navigate only within a narrow channel of fairway. Speed limits on the river vary widely. Not far below Tower Bridge, where the river begins to widen, vessels can and do travel at 30 knots. Watch out for the catamarans of the Thames Clippers service and the tourist RIBs in which passengers belt in for a high speed, white knuckle ride. Between Tower Bridge and Lambeth Bridge the speed limit is restricted to 12 knots, and then from Lambeth Bridge to Wandsworth Bridge the speed increases to 25 knots. Once west of Wandsworth Bridge the speed limit is a more leisurely 8 knots. Occasionally you may spot the Marine Police Unit or the RNLI out on a shout and moving considerably faster than normal speed restrictions allow. The RNLI has four stations along the Thames – and they are kept busy. When paddling in a group, keep all your kayaks fairly close to each other. If you spread out you will be harder to see. This is especially important when crossing the river, when passing busy pontoons and when navigating ‘pinch points’ such as the Thames bridges, where river traffic is squeezed between bridge arches. When crossing the river always take the fastest, most direct route, taking into account river currents and obstacles. 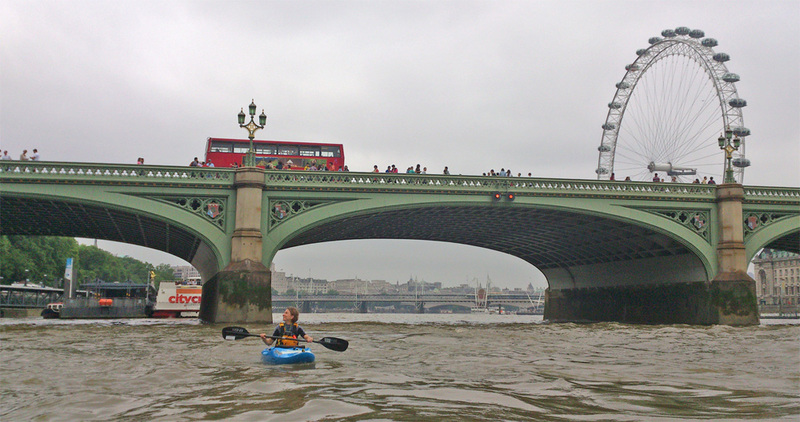 Whilst the general rule is ‘keep right’, don’t assume you can kayak below every bridge arch. A closed arch is closed to all traffic, including kayaks. Closed arches are signified by a three red disks (three red lights at night) on the arch, see illustration below. Other bridge signs to watch out for include a flashing white light (fast flashes or four seconds on, four seconds off) which indicates that something large is about to use the arch. Two amber lights side by side indicate a main working arch, open to commercial traffic (other arches may also be open, without amber lights) and a bale of straw hanging from the bridge (single white light at night) indicates restricted head room – not usually a problem for kayakers. 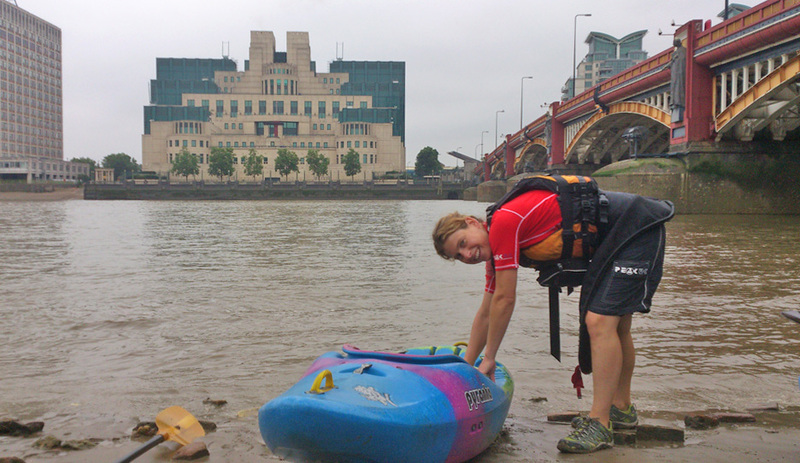 Kayakers must follow the navigation rules at Thames bridges. An arch without any signal is generally open to navigation. The Houses of Parliament are one of the must-see sights for any kayak trip on this section of the Thames – but be aware that there is a restriction zone extending 70m out from the river bank. A series of yellow buoys appear to represent the boundary, but are actually well inside the exclusion zone. Kayakers are unlikely to experience problems, unless they venture inside the yellow buoys. There is one other official exclusion zone, at 85 Albert Embankment, on the south bank and just downriver of Vauxhall Bridge. This building is home to M16, the Secret Intelligence Service, and close inspection is not encouraged. The exclusion zone is 15m here. Thames kayaker opposite M16 – home to the Secret Intelligence Service and several James Bond movies. The ideal kayak for the tidal Thames is the sea kayak or a good touring boat, which will eat up the distance, but slower, river running boats will also suffice. Small groups of kayakers don’t need to inform the PLA when using the tidal Thames, but any large group (20 or more paddlers) would need to give advance notice and provide a detailed plan including risk assessments. If you carry a VHF radio, tune to Channel 14 for Vessel Traffic Services in London. This channel is used and monitored by all vessels in the tidal stretches of the Thames. Alternatively, call 0208 855 0315 to get through to the PLA’s Vessel Traffic Services. The Thames is much cleaner than many urban rivers, but heavy rainfall frequently overwhelms the sewers, which then empty directly into the river. Each year 39 million cubic metres of raw sewage end up in the Thames. This kills fish, damages the river ecosystem, and makes it very wise to wash thoroughly after paddling. In practice you would be extremely unlucky to find yourself paddling in recently flushed sewage, but you may well spot the occasional Thames jellyfish (condom) bobbing along in the current. Projects such as the Tideway Tunnel have been proposed to clean up this problem, but it will be many years yet before we see any action. If you don’t fancy running your own trip, why not explore the tidal Thames with one of the two commercial kayaking outfits on the river, Kayaking London and Moo Canoes? Both come highly recommended, with experienced, friendly staff who enjoy paddling and sharing the river. Paddling on the Thames. Port of London Authority webpage with links.